Not a name that rolls easily off the tongue, eh? What can I say? Brevity has never been a strong point of mine …. Roasting the squash, potatoes, and apple deepens the complexity of their flavors. Caramelizing the onion brings out the sweetness of the onion, and pureeing it into this bisque adds another layer of flavor and heightens the taste in each spoonful. 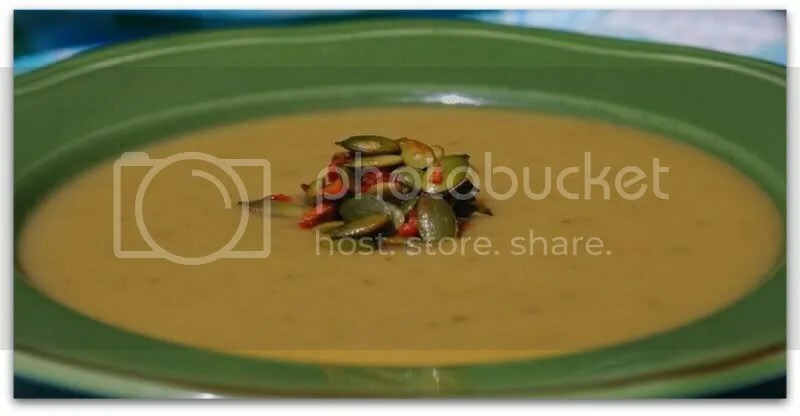 The pepita-pepper garnish serves to both add a bit of a kick to the sweet undertones of the soup and adds some texture to the smoothness of the bisque. Don’t be intimidated by this dish’s long and complicated name – it’s a fairly simple, low-maintenance recipe that packs huge flavor. I will definitely be buying up lots of butternut squash this autumn just to make this soup again and again…. 1. Toss the squash, potatoes, and apple in 1 tablespoon of olive oil in a glass baking dish and roast in an oven that has been preheated to 400F for 45 minutes. 2. While the squash, potatoes, and apple are roasting, heat the remaining olive oil in a skillet over medium heat. Caramelize the onion for 20-30 minutes, until golden brown. 3. After removing the baking dish from the oven, add the vegetables to five cups of vegetable stock and 1 cup of almond milk in a dutch oven. Bring to a boil, lower heat, cover, and simmer for 10 minutes. 4. Add the onion, maple syrup, ginger, nutmeg, parsley, salt and pepper to the soup mixture. Puree the mixture using a handheld immersion blender or a traditional blender until smooth. 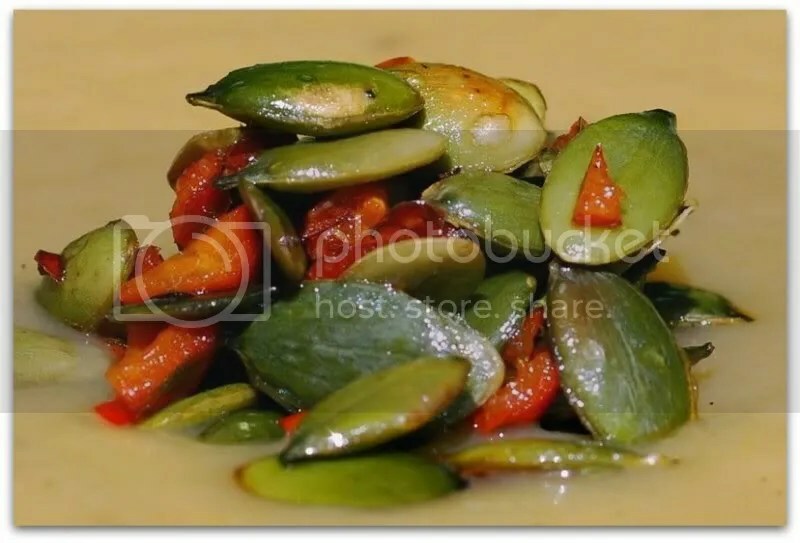 Serve topped with pepita-pepper garnish (recipe below). Melt the EB in a small skillet over medium heat. Add the pepitas and poblano and sauté, stirring often, for approximately 10 minutes. Do you get anything resembling fall weather? What about winter time? We’ve been indulging in pumpkin soup often of late because those seem abundant here now, though it strikes me as odd timing since it’s spring-turning-summer. I bet I could find some good butternuts too, though! I’ll have to give this a whirl! Loved the raw tart (once I got it right)! And yes, I did have some at breakfast time. I have no self control. This looks so delicious. I’m going to try this as soon as I can find some butternuts! They are pretty rare here, but sometimes they have them at the marché. 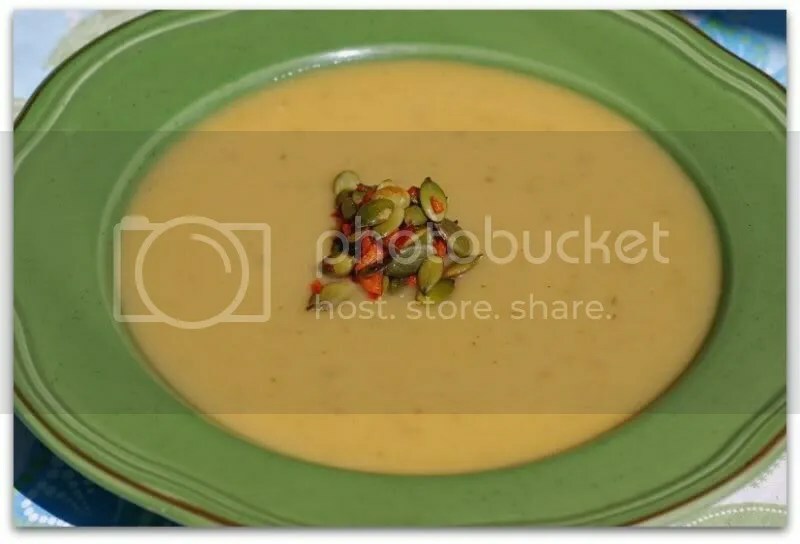 Oh wow, that soup looks great. I’m stuck on one butternut squash soup recipe and I’ve got to break out of it–this might be the light! Sounds incredibly delicious! Great job! Oh, that looks and sounds so good! Jennifer – We have the following seasons: dry season (April – October) and wet season (November-March); whale season (December – April) and not-whale season. 🙂 The wet season tends be cooler (ie. lower-mid 80s) and the dry season tends to be warmer (mid-upper 80s). And I am glad to hear that there was raw tart success! Shellyfish, Jes, and Ricki – I hope the recipe turned out just as well in your kitchens! Vegannifer and Sanja – Thank you for the kind words! Generally I do not read post on blogs, but I wish to say that this write-up very pressured me to check out and do so! Your writing taste has been surprised me. Thank you, very nice article. magnificent points altogether, you just gained a brand new reader. What may you recommend about your publish that you just made a few days in the past? Any certain? Hello there, simply became alert to your blog via Google, and located that it’s really informative. I?m going to be careful for brussels. I will be grateful if you continue this in future. Many people might be benefited from your writing. Cheers!